The outcome of the Samsung Unpacked event, held on the 9th August to launch the new Galaxy Note 9, consisted mostly of confirming the rumours that had already been leaked- with a few surprises. The surprises included the reveal of a brand new product: Galaxy Home, as well as the introduction of Samsung DeX and a collaboration with Spotify. According to DJ Koh, the newest phablet in the Note line is a smartphone for creators and is the ‘world’s most powerful mobile device’, designed to support the new way to work. It was created to be seamless and convenient, including meaningful innovation that enhances the users lives. In terms of design, it will have a 6.4 inch end-to-end display, the largest ever Note screen and has been dubbed as having the best YouTube experience due to it’s size. The fingerprint scanner is situated underneath the camera it’s easier to reach. Four new colours were confirmed; ocean blue with yellow S pen, lavender, copper and midnight black. It’s going to feature the biggest battery-life on a Note thus far, 4000mAh, which they claim will be able to last all day. The minimum storage it will feature is 128GB, twice as much as before, which is the equivalent of storing 670 hours of movies or videos. The largest storage available is 512GB and it’s equipped to support a 512GB expandable storage card, allowing for a total 1TB- more than most laptops. It has a 10 nanometer processor, cooling system and stereo speakers, making it ideal for gaming. The phablet’s dual ‘intelligent’ camera, detects flaws and automatically notifies the user, prompting them to take another photo. It has scene recognition, which identifies and adjusts to different subjects. Bixby has received some developments, making it more ‘personal, conversational and useful’. By this, Bixby now remembers previous questions, apps and entries made by the user so you don’t have to repeat yourself. The release date was confirmed as the 24th of August. The rumours regarding Samsung’s stylus pen were confirmed, with the incorporation of Bluetooth, which turns the pen essentially into a remote control. This enables users to take photos without having to touch the phone, press play and pause on music and YouTube videos and flip through PowerPoint slides. It only takes a minute to charge and you do this by simply putting it back into the phone. The anticipated Samsung smart watch was also revealed. They claim that it looks like a real watch, with a circular bezel design. It comes in two different sizes, with a choice of straps and watch faces. It’s water resistant and has a high resolution AMOLED display with an integrated touch function. It’s a standalone product, so it can be used by itself and it allows you to still receive texts and calls without the presence of you phone. It has a battery-life that can last for several days on a single charge and you can charge it at the same time as the Note with the use of wireless charging. All devices can work together and the aim is that it can connect you to your health, managing stress by prompting physical and mental breaks, tracking your fitness and your sleep quality. It also provides you with daily briefing, the weather report, to-do lists and syncs with the calendar. It’s a stylish surround-sound speaker that you control using Bixby. It has 8 microphones that will pick up voice commands from far away and it detects your location and optimises the sound to your environment. Further details around this instalment of Samsung’s intelligent devices, will be unveiled at the Samsung developer conference. Samsung Dex desktop mode, which is designed for the ‘work anywhere’ generation, makes it easy to multi-task. You can plug the smartphone into a computer using an adapter and it is all powered by the smartphone. This basically means you can still use your phone, while the desktop acts a second screen. The rumour that Epic Games’ Fortnite app is coming to Android was confirmed and, for a limited time, the Note 9 is going to be the first smartphone to feature it. It was also revealed that Samsung will be joining forces with Spotify, to enable multi-device music playing. This works by the music following you from device to device- including the Galaxy Home of course. As you approach a new device, a prompt will come up automatically and it will transfer with the touch of the button. With the rumoured launch of the new Galaxy Note 9 coming up this week (9th August), we’ve gathered everything we know so far, including how much it will cost, how it differs from previous models and what it is reported to feature. The predicted release date is 24th August, so get your S Pens at the ready, if you’re thinking of upgrading. If the recently leaked video is anything to go by, then the answer could be: not much! 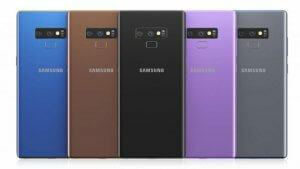 The available colours are expected to range from blue, black and violet to copper and silver, with matching stylus pens. The S Pen for this handset is different from the Galaxy Note 8’s pen, not only because of its bright colour, but because of its ability to control apps using Bluetooth. It’s reported that it can be used to take photos and remotely control music. In terms of overall design, the Note 9 will not display any dramatic changes, but will feature a dual 12-MP camera and notably improved 4,000 mAh battery. The screen size will reportedly remain the same at 6.3 inches and be a QGD+ Super AMOLED display. This has been substantiated by a recent leak that has said the new device will fit Note 8 cases. Samsung CEO DJ Koh allegedly announced that Bixby, the smartphone’s virtual assistant will debut the next generation of artificial intelligence features. The Galaxy Note 9 could even be accompanied by noise-cancelling headphones, or an exclusive Fortnite Android app. It is rumoured that this phablet will likely cost at least £869, which was the same price as its predecessor. It is also supposedly going to boast 1TB worth of storage, but this is apparently only on the basis of buying a 512GB device and then purchasing a further 512GB in expandable memory. Essentially, your individual needs will decide whether you need or want to invest in this model. 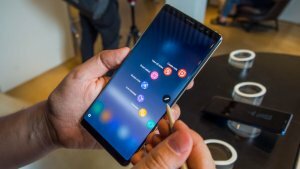 It might be a good option for you if you use your phone for work, as it’s great for taking notes with its larger screen and sharp display, and it should have an immense amount of storage too, although many are arguing you can get all of that from the Galaxy Note 8. Either way, it’s an expensive handset and it’ll only get more expensive as you add more storage.